Hey guys! 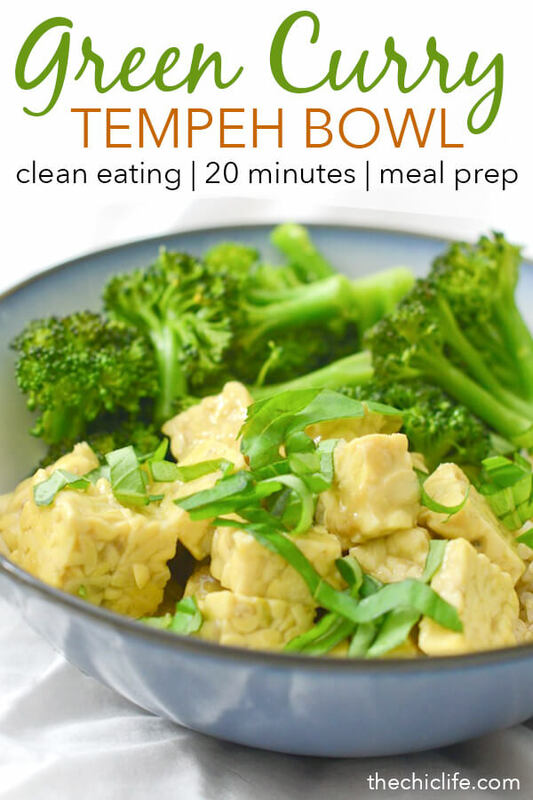 Wanted to pop in with a super simple, healthy, and tasty meal – a Green Curry Tempeh Bowl Recipe. As you know, I’m not vegetarian or vegan, but I do like to eat vegetarian / vegan meals often. I find I can often eat lower calorie meals that are still filling this way. But mostly, I find them easier to prepare for some reason. Maybe because you only need one cutting board and the cook times can be a bit faster at times. As a fan of Thai food, I’d been meaning to experiment with some curry pastes for awhile. So, I took some inspiration from the recipe on the back of my green curry paste. I tried the original recipe but found it a bit on the bland side. So, I jazzed it up with some coconut aminos, garlic powder, and fresh basil. I also added in some peas, which cook quickly and make this nearly a one pot dish. Save the side of rice. By the way, coconut aminos are often used a substitute for soy sauce, so feel free to just use that if you don’t have the former. By the way, I photographed this on one of my initial experiments, before I had the idea to add peas straight to the curry sauce to simply the entire recipe. So feel free to leave the peas out and add your own vegetable side. I did steamed broccoli here. Or follow the recipe to dirty up less dishes for easier clean up. Up to you! 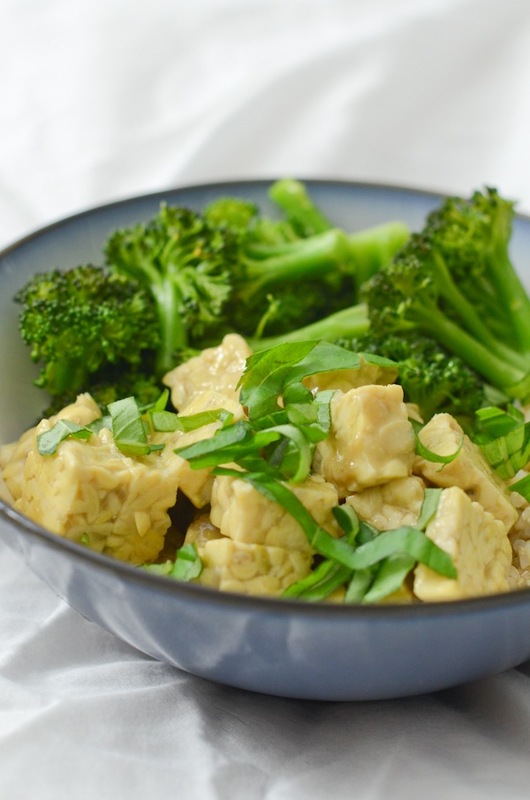 Here’s a super simple tempeh recipe that can be made with or without the veggies cooked into the sauce. See the note in this blog post for details. In a large saucepan, bring coconut milk to a simmer. Stir in green curry paste, brown sugar, coconut aminos, garlic powder, kosher salt, and pepper. Bring to a boil, reduce heat to simmer and cook, stirring frequently for two minutes. Stir in tempeh pieces and cook for 10 minutes over simmer, stirring occasionally. Stir in peas and cook for 2 minutes, or until peas are cooked through, over simmer, stirring occasionally. Serve with brown rice (or base of choice). If not using peas, feel free to add your favorite prepared vegetable. Garnish with fresh basil. Tempeh Tip: The size of your tempeh pieces is not important. Cut to your preference. I like to cut mine in 3 even pieces down the long end and then 11 even pieces down the short end. To simplify, I cut down the short side in half, then halved those halves, and then cut each of those pieces into 3 even pieces. Then I cut those evenly with 3 cuts down the long end. Thanks for stopping by! 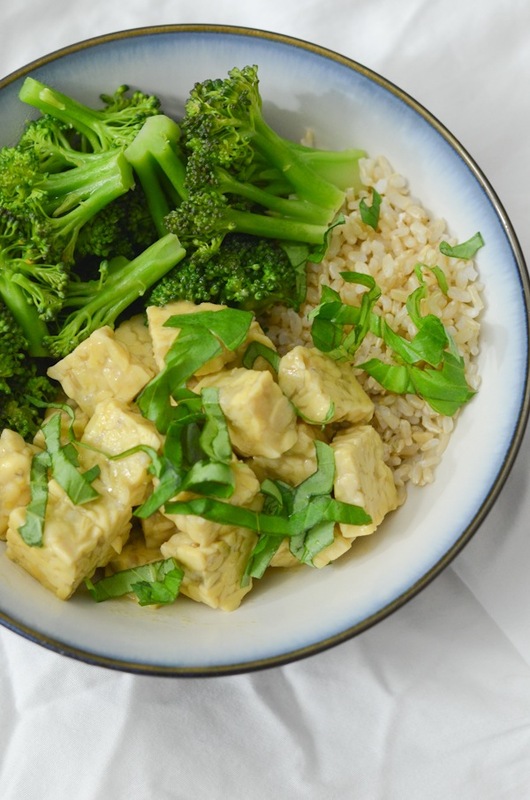 Hope you enjoy this Green Curry Tempeh Bowl Recipe!